Build Blitz 2015 – What a Rush! Recycle Rush is here, and the 2015 Build Blitz team has tackled this complex engineering challenge head-on. Our hope is that the educational resources, guides, and insights created during the past week will help all teams in their pursuit of superior performance. Check out the highlights below! 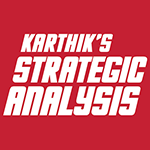 The first major event of the week was Karthik’s Strategic Analysis, an exclusive application of Karthik’s proven “strategy dictates design” methodology to this year’s game. After taking a day to digest the rules and scrutinize its intricacies, Karthik was able to create a prioritized list of design goals intended to maximize a team’s scoring potential. The Analysis continued that evening with a live Google Hangout alongside the President of VEX Robotics, Paul Copioli. Karthik spent some time detailing his strategic priority list before he and Paul took questions from the FRC community. The ensuing conversation was engaging, exciting, and (at times) surprising – if you watch one thing from this year’s Build Blitz, you won’t want to miss this! Stacking Totes is one of the primary (and most versatile) scoring opportunities in Recycle Rush. Whether you’re going for the 40 point Coopertition Stack or building stacks on Scoring Platforms, this is a year to go vertical. 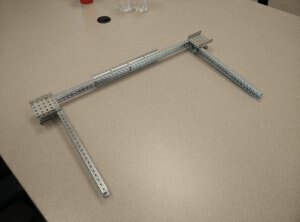 A standard chain-driven linear elevator is an efficient way to accomplish this feat, and one Build Blitz team undertook the challenge of creating one entirely out of VersaFrame. Two new VEXpro kits later, they succeeded. 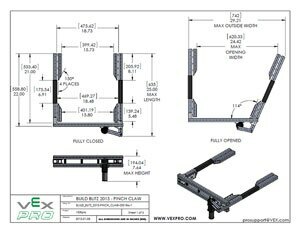 Download a STEP file of the VersaFrame Linear Elevator here and visit the VersaFrame Gussets page to order the new parts required to build your own! Recycle Rush features an element that hasn’t been seen in FRC for several years: multiple types of gamepieces to manipulate. 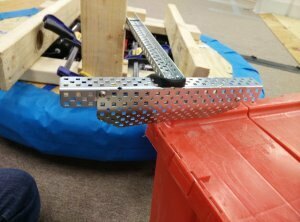 One Build Blitz team took it upon themselves to overcome this engineering challenge by developing a simple pinch claw that can manipulate both Totes and Containers. 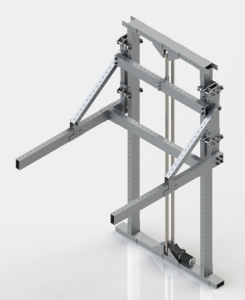 The results were promising – check out the CAD file or drawings below to build your own out of VersaFrame. All successful FRC teams, without exception, implement and follow some sort of design process. The Build Blitz participants are well-versed in their own versions of the engineering design process, having used it for years both on their own FRC teams and in their “real world” jobs or projects. We sat down with each team to ask them a few questions about how they view the design process and how they are applying it to Recycle Rush. The result was one of the most insightful and valuable posts of the week – check it out to find out how they’ve had to adjust their processes this year, how teams can get by without access to CAD, how to avoid common FRC design mistakes, and more! This year, one Build Blitz team tried something new. While custom elevators and linkages are great ways to help elevate the mid-tier of teams, we wanted to go even simpler. How could literally a few pieces of hardware be attached to a basic robot frame and still create a solid contributor to a qualification or playoff alliance? The passive hook and plastic slider prototypes kicked this direction off with great success. It turns out that a few pieces of VEX EDR metal and a sheet of polycarbonate are all that is needed to successfully move Totes around. The second release was a set of forks made out of VEX EDR metal that could manipulate both Totes and Containers, achieving Karthik’s most important strategic goal. These ideas are all about keeping it simple and effective, a crucial lesson for any team looking for a place to get started. Recycle Rush introduced a new element into the mix that has never been seen before in the FIRST Robotics Competition: a nearly complete lack of size requirements. Thanks to this exciting new dynamic, creating a 2015 “Drive in a Day” that would suit all teams was no longer a feasible option. 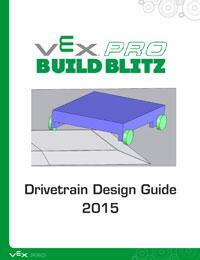 Instead, the Build Blitz team put together a comprehensive Drivetrain Design Guide. 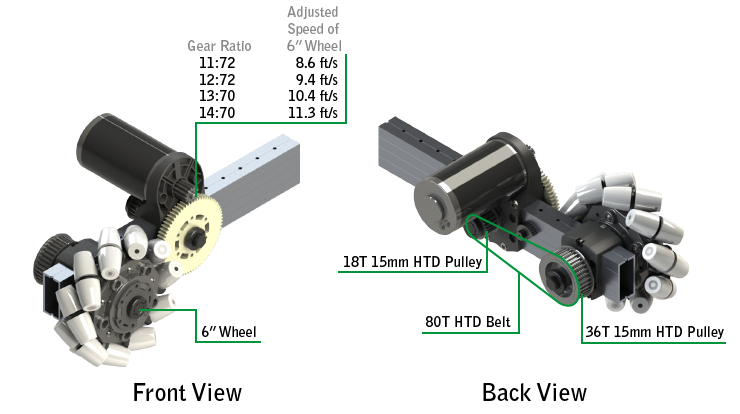 This year, there isn’t a “one-size-fits-all” drivetrain – the ideal drivetrain is the one that fits YOUR robot’s needs. While the guide was created with the 2015 game in mind, it touches on many “evergreen” fundamentals of drivetrain design that will also apply to future years. Explanations for angle of approach, “Crayola CAD”, and an introduction to proper speed and gearing calculations are all included (just to name a few). “When you’re firing up your drivetrain for the first time, and you’re testing to see how it transitions over the bump, remember one thing: center of gravity & weight play BIG roles in the way it will perform. Test your robot in “real life” configuration. Fully loaded, including any game objects it might be carrying. Recycle Rush features another element that hasn’t been seen in FRC for several years: multiple types of gamepieces to manipulate. More than ever, proper claw (manipulator) selection and prototyping is crucial to teams’ success. This guide will help teams learn about a few common manipulator styles and choose the claw that works best for them. 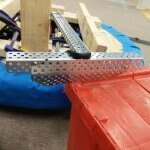 The Recycle Rush Scoring Platform features one of the sharpest approach angles in recent FRC history. If traversing this short but challenging bump is part of your team’s strategy, then proper drivetrain analysis, design, and testing are essential to ensure a smooth transition. With a few minor modifications, the 2015 Kit of Parts drivetrain can be easily adjusted to use VEXpro 6″ Traction Wheels and belts. This upgrade allows your drivetrain’s wheels to maintain full contact with the ground through its entire journey, reducing the risk of frame damage or becoming stuck. This 4-bar stacker was designed to stack up to two Totes on the Step – ultimately using this to assist in gaining Coopertition points. 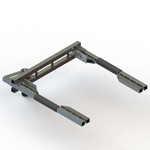 The concept of a 4-bar is common in FRC designs due to its simplicity and effectiveness, qualities which are readily apparent in this design. 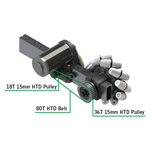 Powered by a VersaPlanetary Gearbox and Mini CIM motor, this linkage can be paired with a pinch claw or other manipulator to stack Totes with ease. One of this year’s desired drivetrain design traits, as identified by the Drivetrain Design Guide, was side-to-side (holonomic) motion. Thanks to a complete lack of defense and the necessity of precision alignment for maximum scoring, being able to strafe sideways is a no-brainer for Recycle Rush. 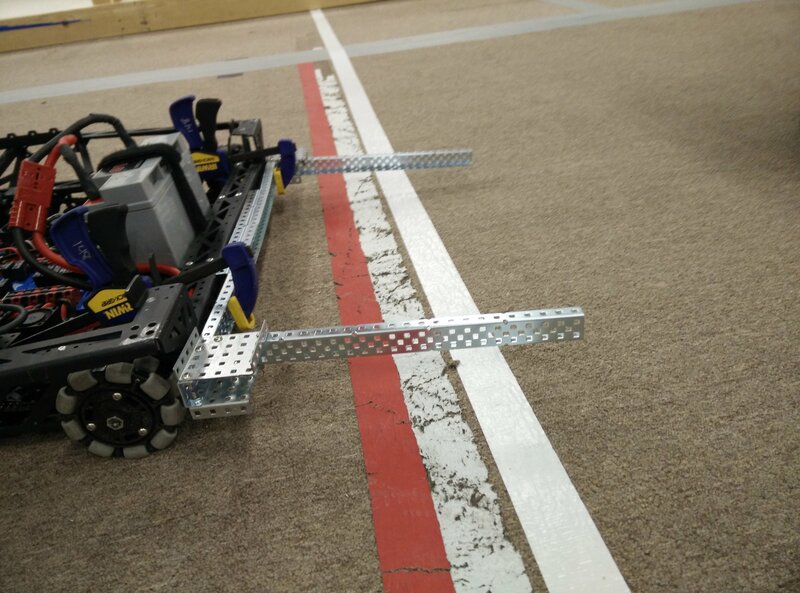 While many teams are often hesitant to bet on a mecanum drive due to its weak performance under defense, these unique wheels actually fit the bill nicely for this year’s challenge. The Build Blitz team put together two options for creating a Mecanum VersaChassis, using both the classic Single Speed Double Reduction Gearbox and the new for 2015 Single Reduction Clamping Gearbox. This entry was posted in Build Blitz 2015 on January 14, 2015 by . 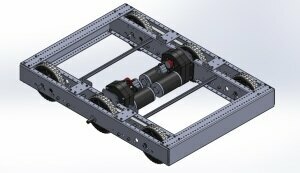 One of the most important aspects of designing a robot this season is how teams construct their drivetrain. 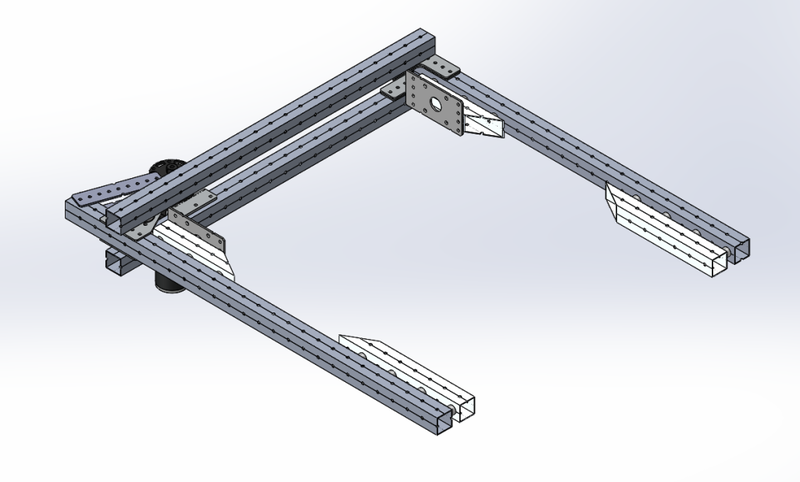 This 6″ Mecanum VersaChassis includes many of the recommended features from this year’s Drivetrain Design Guide, like side-to-side (holonomic) motion, a proper angle of approach to traverse the Scoring Platform, and a slower overall speed than in past years. 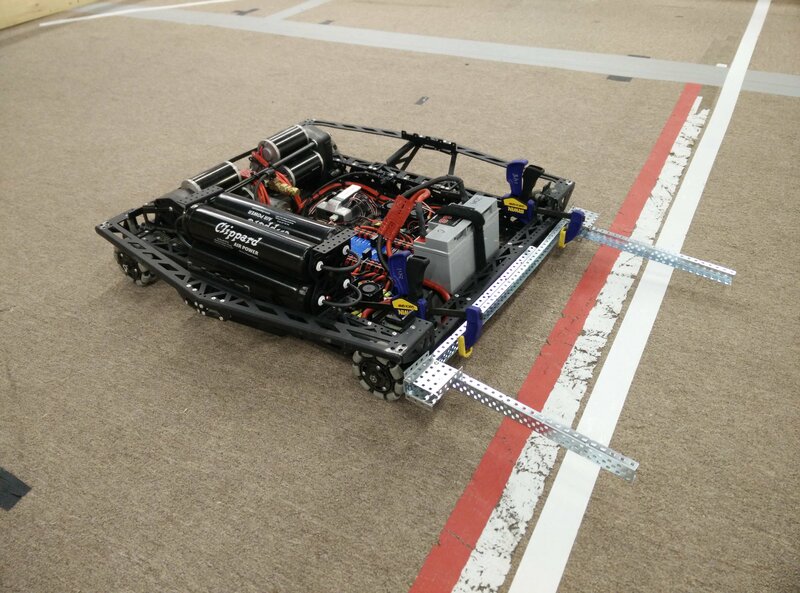 This Mecanum VersaChassis was made to be a base for teams to start building their own robot on. 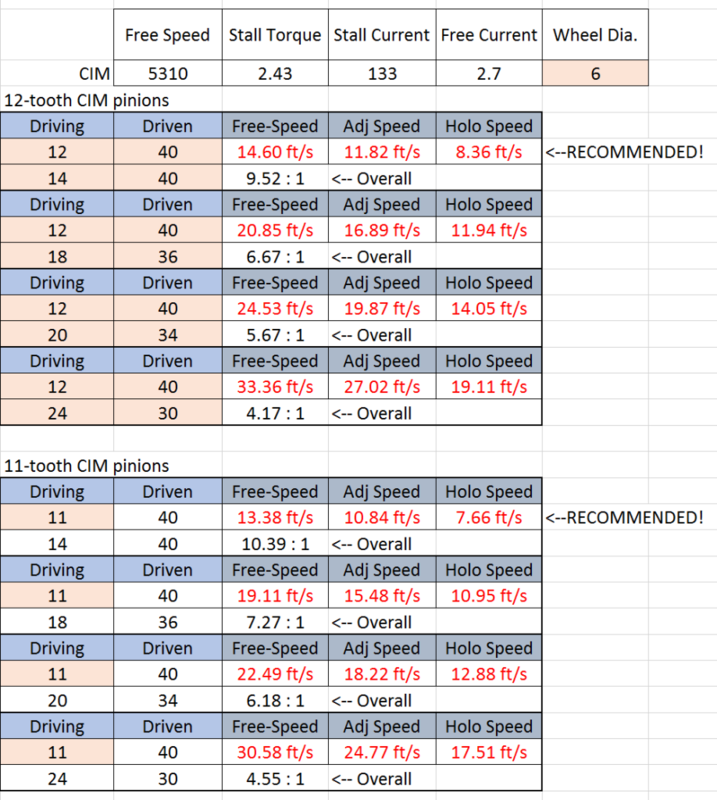 Our recommended gearing calculations are posted below. 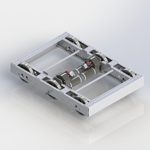 The Single Reduction Clamping Gearbox naturally pairs with a Plastic Clamping Bearing Block or VersaBlock to establish a standard drivetrain gear reduction. For those who wish to use a 6″ wheel, VEXpro HTD belts & pulleys can be used to achieve the same result. Download the STEP file for this Application Example here. The formerly mentioned 4-bar is now complete! We are excited to see what kind of mechanisms teams can come up with to attach to this 4-bar. 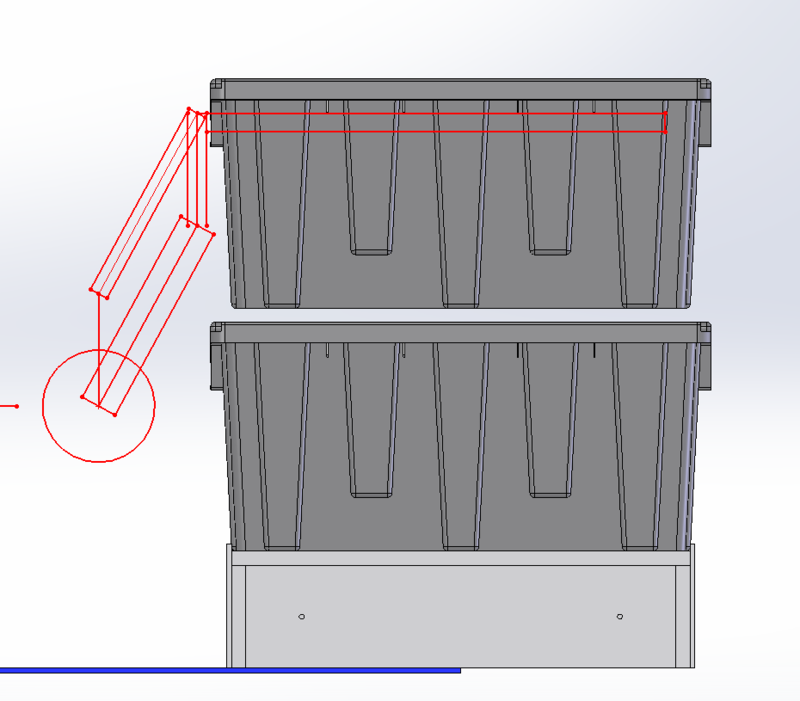 After prototyping this 4-bar simple stacker, it is confirmed that it is able to lift itself a minimum of 19 inches to be able to stack Totes on the Scoring Platform. This system is very adaptable and could merge well with the Pinch Claw or any other object manipulation systems teams come up with! This entry was posted in Build Blitz 2015 on January 13, 2015 by . The previously showcased Linear Elevator is complete! A few minor modifications have been made since the initial video – most noticeably, a constant force spring was added to aid with raising heavy Totes. This elevator is perfect for mounting your favorite object manipulator onto, and can integrate well with many different base robot designs. 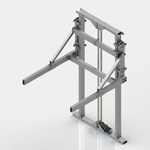 Keep an eye on the VersaFrame gussets page tomorrow, where you’ll be able to purchase the new gussets and build your own VersaFrame Linear Elevator! This entry was posted in Build Blitz 2015 on January 12, 2015 by . 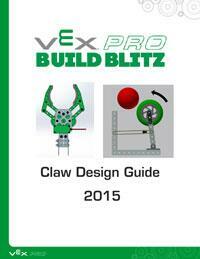 Download the full VEXpro Build Blitz Claw Design Guide here! 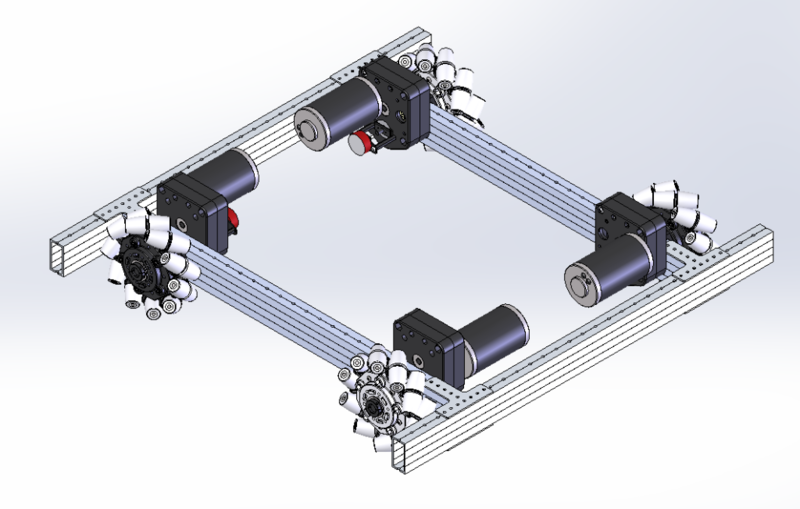 “There are a lot of factors which need to be considered when designing a drivetrain for the 2015 game. Refreshingly, a few of the “historical” constraints have been removed. In addition several aspects of the game may shift a team’s traditional design requirements. This is cool because it forces designers to discount their pre-conceived notions and it provides a fun thought exercise. We love fun thought exercises! Focus on reliability — you need to maximize every match, not just “escape with the win”. 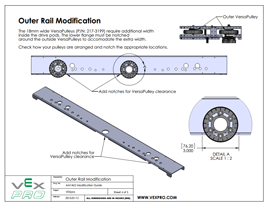 Download the full VEXpro Build Blitz Drivetrain Design Guide here. We can’t wait to see what ideas you come up with! One of the primary benefits of the FIRST Robotics Competition is its emphasis on the engineering design process during build season. All successful FRC teams, without exception, implement some sort of design process. These processes are not a mystery – there are many resources online for teams looking for help. The VEX EDR Curriculum and Karthik’s Strategic Analysis are both great places to start. The Build Blitz participants are well-versed in their own versions of the engineering design process, having used it for years both on their own FRC teams and in their “real world” jobs or projects. We sat down with each team to ask them a few questions about how they view the design process and how they are applying it to Recycle Rush. The varied answers offer an exclusive insight to the core of what it takes to succeed in competitive robotics. What is the most important step in the design process you use for FRC? Most teams have created a design process based on historical assumptions of FRC games. With the major changes in Recycle Rush, what parts of your design process needed to be changed this season? 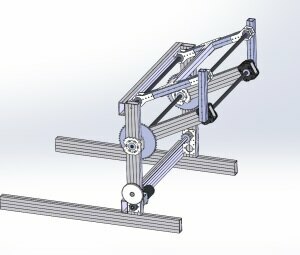 What mistakes in the design process do you commonly see FRC teams making? How can teams without professional engineering mentor support improve their design process? For teams without the ability to use CAD, how would you recommend that teams structure their process to make up for this missing resource? Any final pieces of advice for teams, either about the design process or about Recycle Rush? This entry was posted in Build Blitz 2015 on January 9, 2015 by . Simple Object Manipulation – We’ve Got a Container! The first project from the Simple Object Manipulation group showed two ways to move and score Totes with ease. Totes are only one portion of the game, though. Karthik ranked manipulating Recycling Containers as his top priority, second only to actually driving around the field. It was time for the Simple Manipulators group to tackle this high-value game piece. 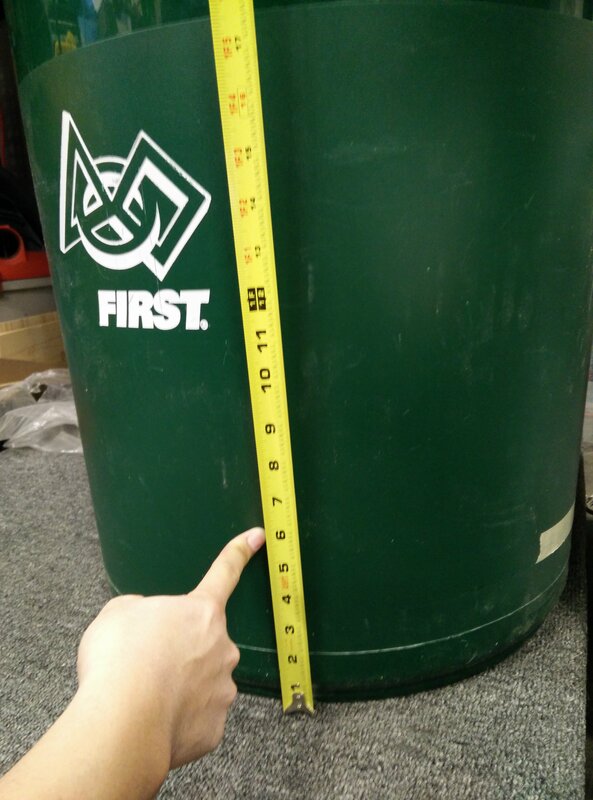 After some manual testing (pushing the Container from various heights by hand), we determined that they can actually be pushed fairly smoothly without tipping over – as long as you keep all pressure approximately 5″ from the ground (or lower). This discovery made the design and prototype very straightforward. By attaching a few pieces of VEX EDR metal to a pre-built drive base (sound familiar? ), we were able to push, guide, and score both Totes and Containers with ease.